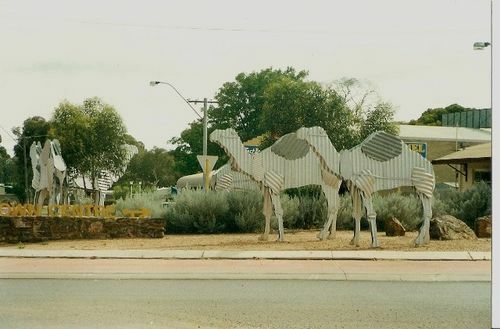 The Tin Camels in Norseman are a tribute to the early camel trains that carried freight to and from the town. Camel teams were a common sight in and around Norseman at the turn of the century. Not only were they favored by prospectors but they were also much involved with the installation and upkeep of the East-West telegraph line, undertaking maintenance patrols well into the 1920s. Camels also transported household goods and mining equipment, and played a major role in the fledgling wool industry on the Nullarbor Plain hauling wagon loads from inland stations to the coast of Israelite Bay or to the rail-head in Norseman.